The holiday season is among us, and people are flocking to social media to share their thoughts about the holidays with friends, family, and followers. 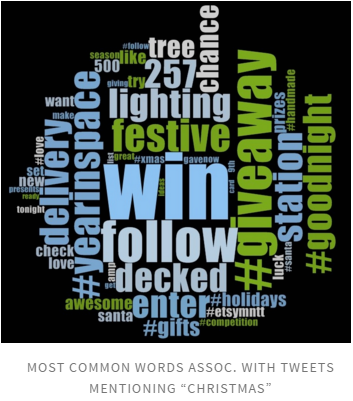 Using Nvivo, a text-analysis software, DASIL tracked tweets with the hashtags #Kwanzaa, #Hanukkah, and #Christmas published on Dec. 10th and earlier to create word clouds that demonstrate the top 100 words most frequently associated with each holiday. Like Christmas tweets, Hanukkah tweets mention words relating to its traditions (“menorah,” “candles,” “lighting,” and “latkes”). 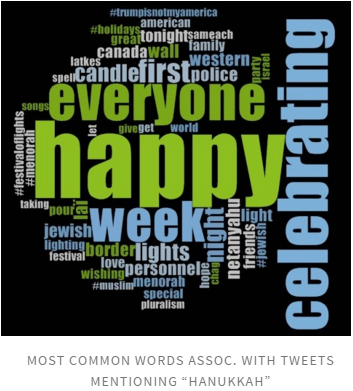 Hanukkah tweets differ from Christmas tweets by centering instead on sentimental values and inclusivity, with words like “happy,” “everyone,” “celebrating,” and “family.” Some Hanukkah tweeters are also using the holiday to highlight political issues, with mentions of “Netanyahu,” Israel’s prime minister, as well as “police,” “western,” “border,” and “#muslim.” Surprisingly, both Hanukkah and Christmas tweets completely ignore their religious roots, with no mentions of words relating to the respective origins of each holiday. The words associated with Kwanzaa, the week-long celebration of African heritage by the West African diaspora, are a grab-bag: words like “celebration,” “promoted,” “happy,” “family,” and “submissions” reveal a mixture of sentimental and commercial connotations. Interestingly, the “#blacklivesmatter” hashtag crops up as one common word associated with Kwanzaa, showing how Kwanzaa, like Hanukkah, is being used as a vehicle to spotlight social and political issues revolving around racial injustice. 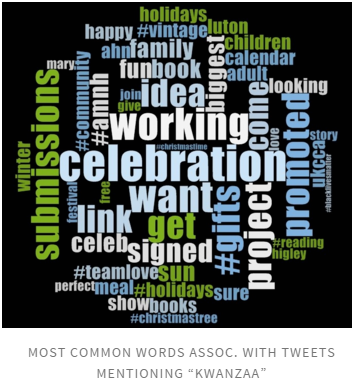 All in all, the big takeaways from this short text analysis are that, of the three current holidays, Christmas is the most commercial. Hannukkah celebrates family and inclusivity, but also has a political edge, while Kwanzaa has a less focused identity.